Not to be confused with Ty Law. Tywon Ronell "Ty" Lawson (born November 3, 1987) is an American professional basketball player for the Sacramento Kings of the National Basketball Association (NBA). Lawson played college basketball for North Carolina where he won a national championship his junior year. He was drafted with the 18th overall pick in the 2009 NBA draft by the Minnesota Timberwolves and was immediately traded to the Denver Nuggets for a future first round pick. Lawson while at North Carolina. Lawson began playing for the University of North Carolina Tar Heels in the 2006–07 season. In 38 games, he led the Tar Heels with 5.6 assists per game and was fourth with 10.2 points per game, during which time he helped the Tar Heels win a share of the Atlantic Coast Conference regular season title, as well as the ACC Tournament. During his sophomore year, he averaged 12.7 points and 5.3 assists per game, although he saw much less playing time due to an ankle sprain that kept him out much of the season. In spite of this nagging injury, he eventually returned to help Carolina repeat as both ACC regular season and tournament champions and ultimately earn a berth to the Final Four. He was charged with driving after drinking on June 6, 2008 by a police officer who felt that Lawson's music was too loud. He was not charged with a DWI because he was below the legal limit of .08 BAC, but still received misdemeanors due to state law prohibiting anyone under the age of 21 from driving after drinking any amount of alcohol. He was also charged for driving with a suspended license. On the day of the deadline to withdraw from the June 16 2008 NBA draft, Lawson decided to return to North Carolina for his junior season, along with Wayne Ellington, Danny Green and All-American Tyler Hansbrough, who all spurned the NBA draft to return to UNC, leaving the starters for the 2007–08 season intact for the 2008–09 season. Lawson was voted to the All-ACC First Team his junior year and was named the ACC Player of the Year, the first time a point guard had won the ACC's highest honor since fellow Tar Heel Phil Ford won the award in 1978. Lawson was also a consensus second-team all-American as a junior, making him eligible to have his jersey honored in the rafters of the Smith Center at the conclusion of his college career. In 2009, Lawson also won the Bob Cousy Award that honors the best collegiate point guard. During the 2009 NCAA championship game, he also set a record with 8 steals against Michigan State, giving him the most steals of any player in an NCAA championship game and helping lead the Tar Heels to a national title. On April 23, 2009, Lawson announced his decision to forgo his senior season and enter the 2009 NBA draft. Lawson in a game for the Nuggets in 2011. Due to concerns of his height and his often-sprained ankle, Lawson slipped to 18th in the 2009 NBA draft, where he was drafted by the Minnesota Timberwolves. However, they had already drafted two point guards, making Lawson expendable. This gave the Denver Nuggets an opportunity to get a quality player as they traded their future draft pick to Minnesota in exchange for Lawson. Lawson served as a backup to Chauncey Billups for one and a half seasons until Billups was traded to the New York Knicks on February 22, 2011 as part of a trade which also sent star forward Carmelo Anthony to New York. On April 9, 2011, Lawson became the first player in NBA history to make his first 10 three-point attempts to start a game. He went 10-of-11 from behind three-point range and finished the game with a career-high 37 points, 7 rebounds, and 6 assists. On August 15, 2011, Lawson signed a one-year contract with Žalgiris Kaunas. The deal included an out-clause that allowed him to return to the Denver Nuggets when the 2011 NBA lockout ended. Lawson played seven Euroleague games during his stint in Kaunas, averaging 7.4 points, 3.0 rebounds and 1.6 assists. In 2012–13, the Nuggets finished with a franchise-best record of 57-25 and earned the third seed in the Western Conference. However, they were eliminated in the first round of the playoffs by the Golden State Warriors. Lawson led Denver in both scoring and assists for the series with averages of 21.3 points and 8.0 assists. In 2013–14, with Danilo Gallinari out injured with a torn ACL, Lawson led the team in points, assists and steals. The Nuggets' 2014–15 season took a turn for the worse with their record dropping to a dismal 30-52, good for the ninth-worst win/loss record in Nuggets history, and had a coaching change mid-season with Brian Shaw being replaced by Melvin Hunt. Despite the turmoil, Lawson managed to have a solid season with 15.2 points and a career-high 9.6 assists per game. His 720 total assists broke the Nuggets' single-season assists record of 714 held by Nick Van Exel. On July 20, 2015, the Nuggets traded Lawson and a 2017 second round draft pick to the Houston Rockets in exchange for Joey Dorsey, Nick Johnson, Kostas Papanikolaou, Pablo Prigioni, a 2016 first round draft pick, and cash considerations. He made his debut for the Rockets in the team's season opener against his former team the Denver Nuggets on October 28, recording 12 points and 6 assists as a starter in a 105–85 loss. He started in the Rockets' first 11 games of the season under coach Kevin McHale. However, after McHale was fired and J. B. Bickerstaff was named interim, Bickerstaff moved Lawson to the bench for the team's November 18 game against the Portland Trail Blazers. On December 18, he was suspended for two games by the NBA based on his guilty plea in November for driving while impaired and a lane usage violation after leaving a party in Denver in January 2015. On January 7, 2016, he was suspended for a further three games by the NBA for driving under the influence of alcohol in July 2015. On March 1, he was waived by the Rockets in a buyout agreement. On March 7, 2016, Lawson signed with the Indiana Pacers. He made his debut for the Pacers later that night at home against the San Antonio Spurs, managing just five minutes of action before spraining his left ankle during the second quarter, which ruled him out for the rest of the game. He missed the following five games before returning to action on March 21 against the Philadelphia 76ers. On August 31, 2016, Lawson signed with the Sacramento Kings. Lawson has been arrested at least four separate times for driving under the influence (DUI). In 2008, 20-year-old Lawson pleaded guilty to underage drinking and driving after registering a .03 blood-alcohol level during a traffic stop in Chapel Hill, North Carolina. Additional charges of violating a noise ordinance and driving with a revoked or suspended license were dropped and Lawson was required only to complete 20 hours of community service. In April 2012 in Arapahoe County, Colorado, Lawson was cited for careless driving, driving with a restricted license and permitting an unauthorized person to drive his car. Lawson was arrested in Denver on January 29, 2013 for avoiding prosecution for these offenses. He later pleaded guilty to allowing an unauthorized person to drive and the other charges were dropped. On August 17, 2013, Lawson and his girlfriend, Ashley Pettiford, were arrested by police in Arapahoe County responding to a domestic violence call. Lawson was arrested on suspicion of committing two misdemeanors, domestic violence-related harassment and property damage. Both Lawson and Pettiford were released on $1,000 bond and charges were ultimately dropped. On January 23, 2015, Lawson was arrested in Denver after driving almost twice the speed limit while under the influence of alcohol. In that incident, he admitted to police that he had a prior arrest for DUI in Missouri. One of the conditions of his $1,500 bond was that he not drink alcohol. On July 14, 2015, Lawson was arrested in Los Angeles on suspicion of driving under the influence. On July 17, a Denver judge ruled that Lawson would be required to spend a month at a residential rehabilitation center before facing DUI charges in either Colorado or California. ↑ Dempsey, Chris (October 18, 2009). "Nuggets rookie Lawson quick on the court, quicker with a practical joke". DenverPost.com. The Denver Post. Retrieved April 18, 2011. 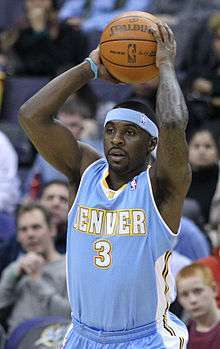 ↑ "Ty Lawson - Denver Talent Magazine". DenverTalentMag.com. Denver Talent Magazine. June 1, 2012. Retrieved March 21, 2016. ↑ "Ty Lawson bio". GoHeels.com. Retrieved March 21, 2016. ↑ "North Carolina battles back, but Rush, Kansas close out Tar Heels". ESPN.com. ESPN Internet Ventures. April 6, 2008. Retrieved April 6, 2008. ↑ "Lawson pleads guilty to driving after underage drinking". WRAL.com. August 19, 2008. Retrieved August 22, 2008. ↑ "Tar Heels' Lawson charged with driving after consuming alcohol". ESPN.com. ESPN Internet Ventures. June 6, 2008. Retrieved June 6, 2008. ↑ "Tar Heel trio to return to school, withdraw from NBA draft". NewsOK.com. June 16, 2008. Retrieved June 16, 2008. ↑ Cohen, Ben (March 10, 2009). "Lawson Named ACC POY; Henderson Only Nabs 2 Votes". DukeChronicle.com. Retrieved March 10, 2009. ↑ "Lawson, Ellington entering draft". ESPN.com. ESPN Internet Ventures. April 23, 2009. Retrieved March 21, 2016. ↑ Stapleton, Arnie (June 25, 2009). "Wolves trade Lawson to Denver". USAToday.com. USA Today. Retrieved June 25, 2009. ↑ "Knicks Acquire Four-Time All-Star Carmelo Anthony". NBA.com. February 22, 2011. Retrieved March 21, 2016. ↑ "Ty Lawson scores career-high 37 to help short-handed Nuggets". ESPN.com. ESPN Internet Ventures. April 10, 2011. Retrieved April 10, 2011. 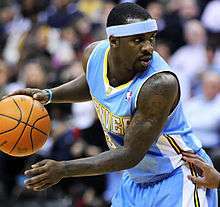 ↑ "Zalgiris inks playmaker Ty Lawson". EurocupBasketball.com. August 15, 2011. Retrieved July 20, 2015. ↑ "Ty Lawson taking his game to Lithuania". ESPN.com. ESPN Internet Ventures. August 16, 2011. Retrieved August 16, 2011. ↑ "LAWSON, TY - Euroleague stats". Euroleague.net. Retrieved April 17, 2015. ↑ "Ty Lawson 2012-13 Game Log". Basketball-Reference.com. Retrieved March 21, 2016. ↑ "2013-14 Denver Nuggets Roster and Stats". Basketball-Reference.com. Retrieved April 17, 2015. ↑ Olson, Mike (April 17, 2015). "Closing the book on the 2014-15 Denver Nuggets season". DenverStiffs.com. SBNation. Retrieved April 17, 2015. ↑ "Rockets Acquire Ty Lawson and Second-Round Pick from Denver". NBA.com. July 20, 2015. Retrieved July 20, 2015. ↑ "Gallinari's 23 points leads Nuggets over Rockets 105-85". NBA.com. October 28, 2015. Retrieved October 28, 2015. ↑ "Ty Lawson 2015-16 Game Log". Basketball-Reference.com. Retrieved March 21, 2016. ↑ Watkins, Calvin (December 18, 2015). "Ty Lawson, suspended two games, considering options outside Houston". ESPN.com. ESPN Internet Ventures. Retrieved December 18, 2015. ↑ Watkins, Calvin (January 7, 2016). "Ty Lawson suspended for Rockets' next three games". ESPN.com. ESPN Internet Ventures. Retrieved January 7, 2016. ↑ "Rockets Waive Ty Lawson". NBA.com. March 1, 2016. Retrieved March 1, 2016. ↑ "Pacers Sign Ty Lawson". NBA.com. March 7, 2016. Retrieved March 7, 2016. ↑ "Pacers take control early, surprise Spurs with 99-91 victory". NBA.com. March 7, 2016. Retrieved March 7, 2016. ↑ "Pacers' playoff push gets jumpstart with win over 76ers". NBA.com. March 21, 2016. Retrieved March 22, 2016. ↑ "Kings Sign Free Agent Guard Ty Lawson". NBA.com. August 31, 2016. Retrieved August 31, 2016. ↑ "UNC's Lawson pleads guilty to underage drinking and driving". ESPN.com. ESPN Internet Ventures. Associated Press. August 19, 2008. Retrieved July 18, 2015. 1 2 Holden, Will C. (January 24, 2015). "Denver Nuggets star Ty Lawson arrested on suspicion of second DUI". KDVR.com. KDVR. Retrieved July 18, 2015. ↑ Shiff, Blair (January 23, 2015). "Ty Lawson taken into custody for suspicion of DUI". 9News.com. KUSA. Retrieved July 14, 2015. 1 2 "Nuggets' Ty Lawson to enter private alcohol treatment after DUI". ESPN.com. ESPN Internet Ventures. July 18, 2015. Retrieved July 18, 2015. ↑ Ley, Tom (July 14, 2015). "Ty Lawson Arrested For DUI For Second Time In Six Months". Deadspin.com. Gawker Media. Retrieved July 14, 2015. Wikimedia Commons has media related to Ty Lawson.